I highly recommend visiting the Forbidden City and Tiananmen Square with a guide, because it allows you to understand the importance and meaning of its buildings and spaces. We had a great experience. Our guide Qing was excellent, she gave us loads of information and interesting stories about the sights, helping us make the most of our visit. Luckily the tour was our very first activity in Beijing, so what she taught us helped a lot when visiting other sights such us the Summer Palace and the Temple of Heaven by ourselves. Albert was a fantastic tour guide. Very helpful and informative. Kept all 8 of us engaged and interested, kids included. So glad we did this tour. This is a fantastic way to spend a day in Beijing. Vivian met our small group of 4 in our hotel lobby and we walked to Tiananmen Square and then on to the Forbidden City. We stopped at intervals to take in the sights and learn about Chinese history. There were lots of photo ops. Vivian was a great guide - she is knowledgeable, passionate and experienced. We learnt a lot and would definitely recommend this tour. The small group tour was ideal because it allowed us to do all the things we wanted to do at the pace we wanted to go, without having to do what we weren't interested in. Our guide, Susan was very knowledgeable and her English was excellent. She also gave us lots of tips for the rest of our trip, took us on the underground so we would be able to do that at other times and put us on a bus to our next sightseeing location. She went above and beyond what we expected. Albert was waiting us in the hotel lobby. He was friendly, professional, spoke perfect English. He offered many interesting facts about Tiananmen Square and Forbidden city Sometimes with references to popular culture to help understanding. The tour was fantastic, sights were incredible. I highly recommend this tour and would not mind going again. Our tour was excellent our guide was excellent. The subject of the tour is enormous, and it is fascinating. My apple watch said we walked over 27,000 steps including from and to the hotel. Our guide was very knowledgeable, and we helpful offering us suggestions for lunch and dinner. If you are in good shape for walking this tour is great. If you are not comfortable walking long distances I can not recommend visiting Tiananmen Square and the Forbidden City. We enjoyed the tour and highly recommend it. 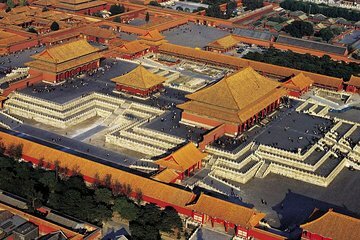 On this tour, you will be able to see every part of the Forbidden City that is open to the public, as well as all of its exhibits, and you will not be rushed. I can't image seeing the Forbidden City without our guide there to provide the historical context and significance, and his English was very good.